This selection of 2-digit subtraction worksheets will help kids further hone their skills in subtraction with a stronger grasp on the concepts of regrouping and no regrouping. A plethora of worksheets contains a variety of tasks that include like columnar and horizontal subtraction, fill in the missing numbers, and much more. A number of word problems have been thrown into the mix for variety! Free printable worksheets are also at your disposal. 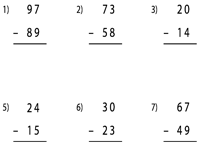 This section provides adequate worksheets to practice two-digit subtraction. 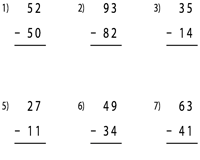 Find the difference between each set of numbers that do not require regrouping or borrowing. This series of two-digit subtraction worksheets will introduce young ones to the concept of borrowing from tens place. Reinforce the children's skills in subtraction by providing ample practice with the variety of worksheets available here. Each worksheet featured here contains twelve columnar or horizontal subtraction problems along with a set of word problems that make it an intriguing mix! Use the answer key to check your responses. These double-digit subtraction worksheets will rejuvenate your child's mind as it emphasizes on the concept of regrouping or borrowing. 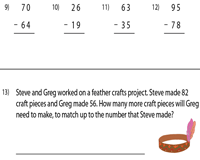 Use the download option to access this set of worksheets that contain word problems as well! Two levels of 2-digit subtraction worksheets are provided here to help your child engage in logical reasoning. 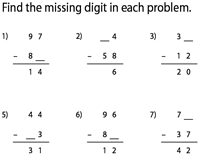 Find the missing digits to arrive at the difference in each subtraction problem. 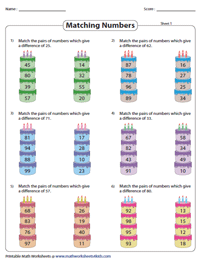 Work up your appetite for two-digit subtraction with these enticing 4-tier cakes. Connect the values on the left with the values on the right to match the given difference. Download these sheets for a delectable learning experience!